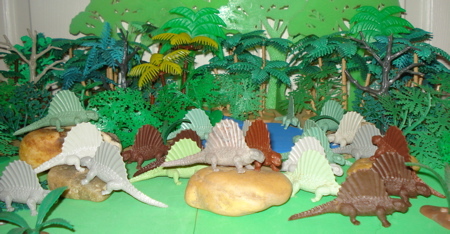 The Marx Dimetrodon is very recognizable! It is hard to even begin describing my relationship with the Marx Dimetrodon. I had first been fascinated with Dimetrodons from seeing the 1940 movie One Million B.C. that showed regularly on TV stations in the early 1950s. Perhaps "regularly" isn't the correct word. Incessantly is more fitting. 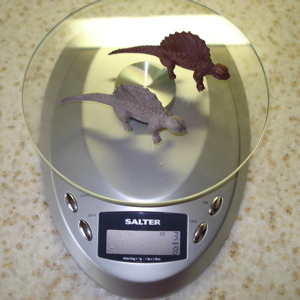 But the fact of the matter is that the only Dinosaur toys Dimetrodon available at the time was the fragile SRG figure from the American Museum of Natural History. I kept having to replace it due to breakage which really diminished its utility as a Dinosaur toy. 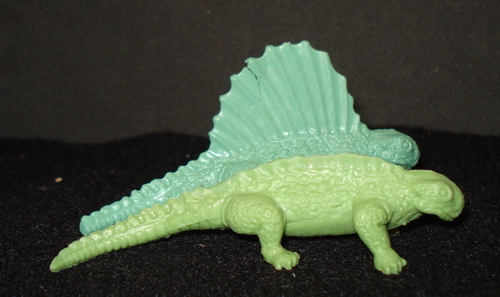 Then, in 1955, the Marx Toys company came out with their first Dinosaur toys and one of these, part of what Marx referred to as the "small mold group" (something I neither knew nor cared about at the time), was the (actually two of this) wonderful Dimetrodon. It weighed three-sixteenths of an ounce (above, left) (.1875 oz, 5 gms) and measured three & three-eighths (3.375", ~8.5 cms) in length. 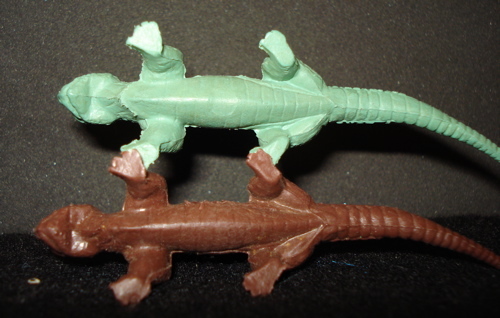 While "Marx" chose to say they were seven feet long (making the 1/25 scale) their actual length is closer to eleven feet making these a true scale 1/39. 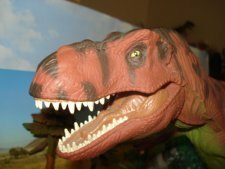 They fit right in with many of today's Dinosaur toys, such as The Carnegie Collection. Typically pictured laying around in groups, usually by a waterhole, like today's Crocodiles, sunning themselves, with their distinctive sail-backs really being the only thing to distinguish them from the modern-day reptiles. We do not know much about their day-to-day lives but we do know that the Permian Period, during which the Dimetrodon thrived, was a comparatively dry time and it is quite likely that these were more accustomed to desert-like conditions than the swampy world they were usually pictured in. 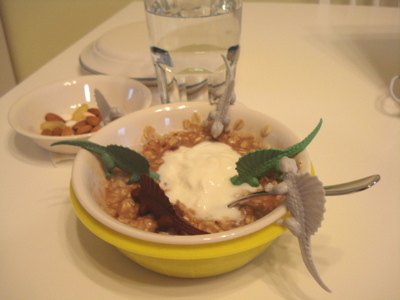 Rushing in to eat breakfast (below, left) and, occasionally, finding breakfast eating them. 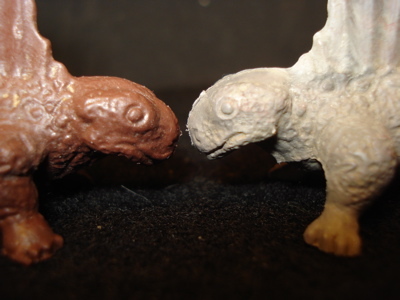 The original Marx Dimetrodons came out in 1955 and there were two of them, virtually indistinguishable from each other. *(see below) They came in either flat green or flat gray (Marx liked 'earthy' tones) and filled my need. 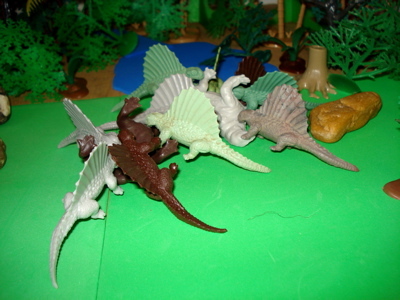 In 1959 Marx came out with a third Dimetrodon, part of their revised mold group which introduced the new T-Rex and helped to eliminate the Kronosaurus (but those are stories for a different time). 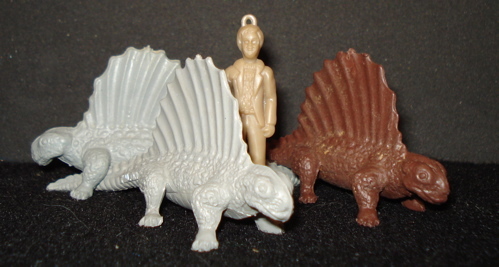 As things turned out the small mold was lost sometime in the 1970s and the Marx Dimetrodon would have gone plastinct if not for the revised mold figure. 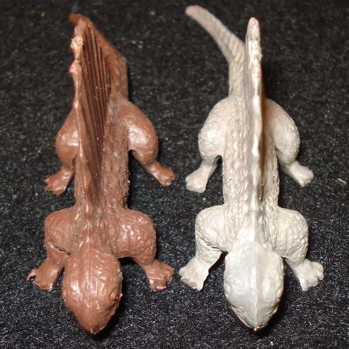 brown revised) you may note that the small mold Dimetrodon's chest has distinct, sharply edged planes, where the three molds join together. The brown revised's chest melds together very smoothly into the throat, creating a more 'natural' look. 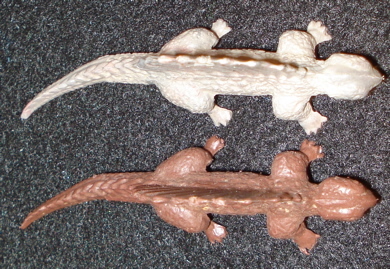 Apart from the T-Rex this is the only "revised mold" figure I consider to be a definite improvement over the original. We should all glad it's still with us. Apart from the above noted differences these three are generally indistinguishable, one from the others. As can be seen, just a casual look, without examining the underside, will not allow you to tell the two mold versions apart. 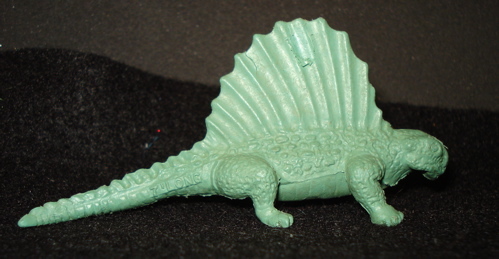 that this same Marx Dimetrodon figure also has a slight crack in the sail between the 7th and 8th spines. What a coincidence!! Catching a small herd of Marx Moschops (the largest Permian Period herbivore- 16 feet long and weighing about a ton) our intrepid Dimetrodons perceive a lumbering picnic set out for their dining pleasure, with drinks. They intimidate, and then attack the unlucky vegetarians and discover that the two they catch will provide a quite adequate meal for their pack. The Marx Dimetrodon is still the Apex Predator it always was! Do NOT under estimate it. Okay? Thanks. 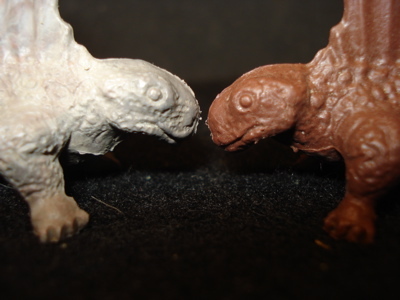 In terms of availability, given that there were two produced in every Small Mold and the Revised is still in production (Marx of Mexico) they are among the more common of the extant Marx Dinosaur toys. When I sell them I ask $4.99 (plus shipping) and I think that that, generally, is a fair price. Especially for the later, waxy, "Heritage" plastic. Now, of course, some will be worth a little (or a lot) more. This depends on the type of plastic and the color of the figure, and its provenance (Dump figures will command a premium). 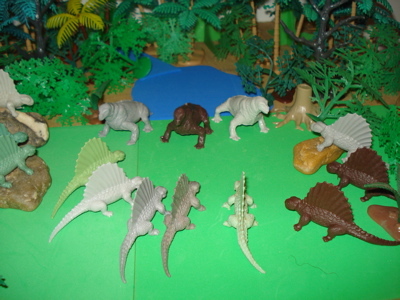 The older, flat plastic figures will also appear in a much greater variety of colors, including the basic colors (green, gray and brown), and some of those colors will increase the value. 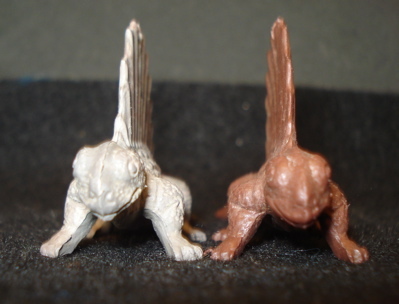 You can often find these selling on eBay, usually as members of small lots although, occasionally, as singles. Despite the regular evidence of persons unknown chewing on these we have no idea if those individuals didn't die a horrible death (like the Moschops) from doing so. 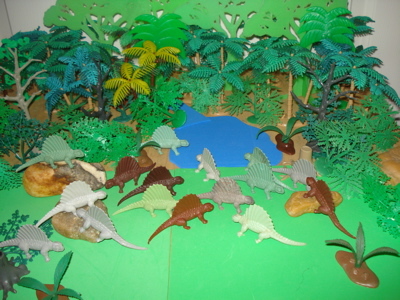 It is widely believed that the "flat" plastic figures are of a lead-based plastic and not recommended for children and other chewsome creatures. 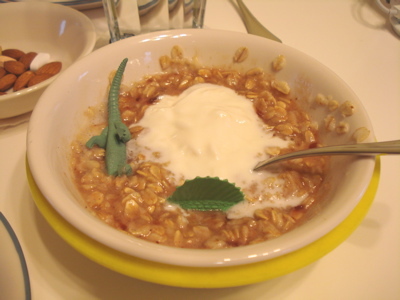 Leave the chewing to the Dimetrodons. We certainly hope that you have enjoyed this page featuring the Marx Dimetrodon and will use this link to return to our main 'Before the Dinosaurs' page.